Symmetrical gables, large bay windows, and expansive porches beckon families to this gracious yet relaxed farmhouse with room to grow. A voluminous family room features a two story ceiling and built-in cabinets on either side of the fireplace. The master suite, located off the family room for convenience, features a tray ceiling, ample closet space, and a lush, private bath. The rest of the first floor receives added volume from nine-foot ceilings. 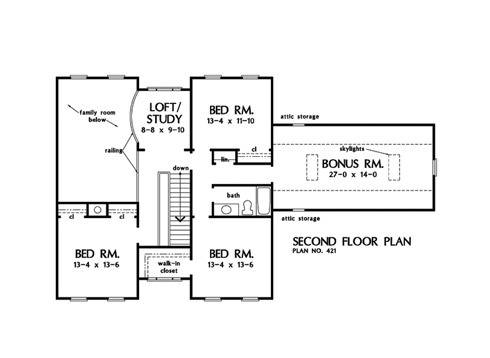 The second floor includes three spacious bedrooms that share a full bath and an easy access bonus room with skylights. A versatile loft/study overlooks the great room below. 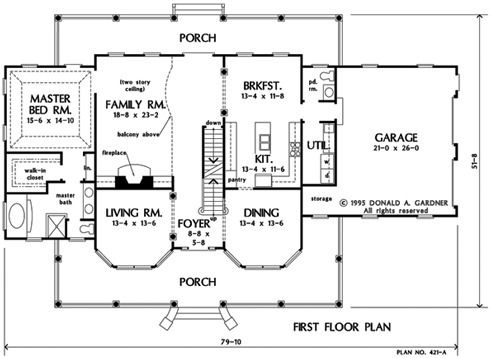 2nd Floor: 1000 Sq. Ft.
1st Floor: 1943 Sq. 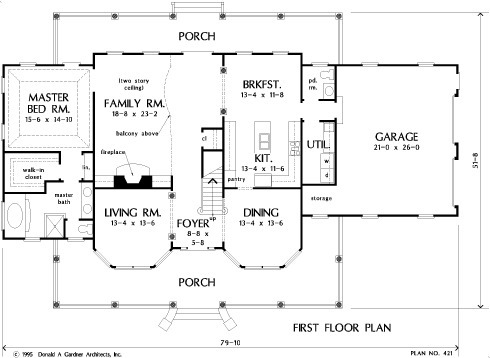 Ft.
House Dimensions: 79' 10" x 51' 8"
Great Room: 18' 8" x 23' 2"
Master Bedroom: 15' 6" x 14' 10"
Master Bedroom (Tray): 15' 6" x 14' 10" x 10' 6"
Bedroom #2 : 13' 4" x 13' 6" x 8' 0"
Bedroom #3 : 13' 4" x 13' 6" x 8' 0"
Bedroom #4 : 13' 4" x 11' 10" x 8' 0"
Porch - Front : 50' 8" x 10' 4" x 0' 0"
Porch - Rear : 36' 8" x 7' 0" x 0' 0"
Loft / Study : 8' 8" x 9' 10" x 8' 0"
Living Room : 13' 4" x 13' 6" x 9' 0"
Foyer : 8' 6" x 5' 8" x 9' 0"
Dining Room : 13' 4" x 13' 6" x 9' 0"
Great Room (2 Story): 18' 8" x 23' 2" x 18' 0"
Kitchen : 13' 4" x 11' 6" x 9' 0"
Breakfast Room : 13' 4" x 11' 8" x 9' 0"
Utility Room : 5' 8" x 10' 10" x 9' 0"
Bonus Room (Vaulted): 27' 0" x 14' 0" x 8' 0"
Garage : 21' 0" x 26' 0" x 0' 0"
Garage Storage : 5' 8" x 5' 1" x 0' 0"